Blue Lodge Dues Book. 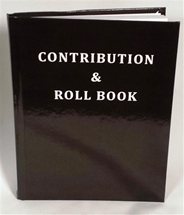 Keep a record of your dues payments with Macoy's handy pocket sized dues book. For any organization. Tan book with Red printing and any emblem of your choice. Size - 3-1/4" X 2-1/4". Heavy paper cover. Good for 7 years of dues.